NOTES: From the point of view of the altitude this itinerary presents a wavy profile. Its only real roughness is to be found in the valley stretch in the vicinity of Lago dell’Accesa and in the final climb to central Massa Marittima (2.5 kilometres). One can reduce the difference in altitude by about 100 metres starting from the petrol station below Massa Marittima on the road to Follonica. In this case one follows the large bypass in the direction of Siena for about 5 kilometres up to a crossroads to Massa: one turns right in the direction of central Massa and, almost immediately, one takes the byroad on the left to Ghirlanda and Ribolla. 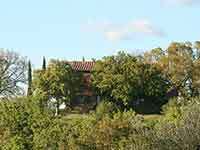 One leaves central Massa Marittima in the direction of Siena and Larderello. Shortly before taking the provincial road S.P. 439 to Larderello one turns right in the direction of Ghirlanda and Ribolla. The road keeps level for about 6.5 kilometres and then starts downhill quite steeply for 3 kilometres towards the old village - farm of Perolla -coming into view on the left. From now on the road continues decidedly downhill as far as a T-crossing not to be missed. Here one takes to the right following the road sign to Gavorrano. 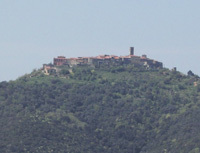 After exactly 1.1 kilometres one meets a bypath on the left marked by a yellow sign indicating Castel di Pietra. This short detour (3+3 kilometres) towards the castle is to be recommended: cycling for 2.3 kilometres on a smooth-flowing dirt-road fringed with cypresses andthen to the right, starting the climb of 700 metres towards the medieval stronghold. One leaves the bicycles at the beginning of the pathway and continues on foot to the castle ruins on the top of a hill. At this point one retraces one’s path arriving at the tarred road to continue one’s itinerary cycling for 2.5 kilometres as far as a crossroads. Keeping to the right one follows the road sign to the Lago dell’Accesa. After two kilometres a stretch of steady and good for cycling on climb begins, leading to the locality La Pesta: now it is the ideal moment for a refreshing halt (there is a bar) followed by another short detour on the dirt road to the nearby Lago dell’ Accesa. Returned to the main road one pedals as far as a not to be missed crossroads where one takes to the right in the direction of Massa Marittima. 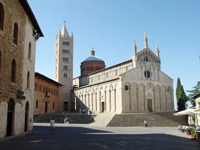 From now on one cycles downhill reaching the road that starts at the foot of the Massa Marittima rise, cycling uphill on the last stretch as far as the square with the cathedral (35.5 kilometres). Lago dell'Accesa (ant.te Lacus Lacchise) is in the degradation of the Metalliferous Hills of Grosseto towards Grosseto Maremma, the southern end of the municipality of Massa Marittima. The Lago of, the particular shape of a horseshoe, has a depth ranging from 20 to 70 meters. Popular legend says that the lake would be bottomless, but could reach a submerged country. In fact, on its banks, there are significant archaeological finds and in the woods near a real Etruscan mining settlement. The Parco archeologico del Lago dell'Accesa is an archaeological site located in località La Pesta, nei pressi del lago dell'Accesa. 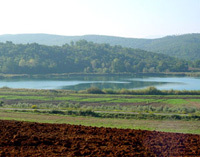 The archaeological site of Lago dell'Accesa is a few kilometres from Massa Marittima in the direction of Gavorrano. The park, in the immediate vicinity of Lago dell'Accesa, can be reached on foot or by car from thelocalità Pesta, situated on the provincial road 49. There is ample space for parking. On foot, you can reachthe sitebthrough a wooden bridge over the river Bruna and along an avenue of eucalyptus trees for no more than two hundred meters. By car, you can follow a gravel road that starts from Pesta and reaches the excavation area after a distance of about four hundred meters. Questo articolo è basato sugli articoli Parco archeologico del Lago dell'Accesa e Lago dell'Accesa dell' enciclopedia Wikipedia ed è rilasciato sotto i termini della GNU Free Documentation License.